Garden Phlox (Phlox paniculata), also called summer phlox, is a sun-loving perennial with a long flowering season. Large clusters of flowers, called panicles, sit atop stems that grow 3 to 4 feet tall. 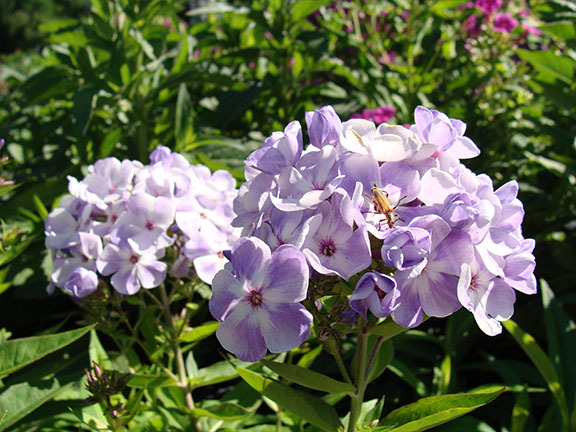 Nothing beats the appeal of garden phlox plants, with long lasting re-blooming flowers in a variety of colors that attract butterflies, hummingbirds and other pollinators; it has long been a favorite garden plant. Garden Phlox are ideal for sunny borders. In addition, the large clusters of pink, purple, lavender or white flowers bloom for several weeks in summer, and make excellent cut flowers. Many are native American wildflowers that thrive in USDA plant hardiness zones 4 to 8. 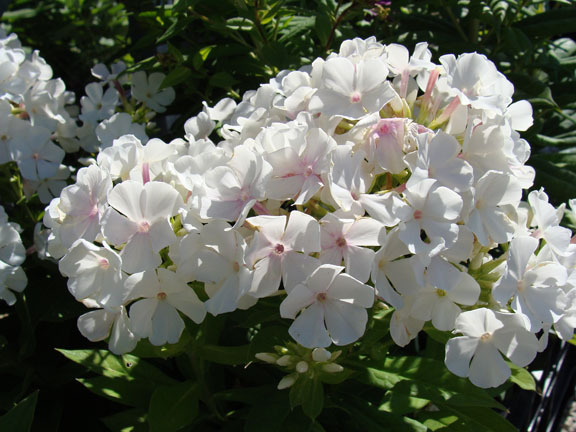 Plant Garden Phlox in a location that is sunny to mostly sunny with moist but well-draining soil. Work some compost into the soil before planting if the area doesn’t manage water well. Give the plants plenty of room, especially in hot, humid areas where air circulation around the plant will help keep powdery mildew to a minimum. Use the recommended spacing on the plant tag, which is usually 18 to 24 inches. Fertilize with a shovelful of compost for each plant – or a light application of 10-10-10 fertilizer at planting time and again just before the flowers open. If you fertilize once more after the flowers fade, you may get another flush of flowers. Water garden phlox plants weekly for the first few weeks and often enough to keep the soil lightly moist thereafter. Always water the plants during dry periods. Keep the foliage as dry as possible by applying the water to the soil rather than the foliage. Spread a 2- to 3-inch layer of mulch around the plants to help the soil hold moisture. If you want to get the maximum height from tall garden phlox, clip the weakest stems from the plant when they are about 6 inches tall, leaving only five or six stems on the plant. Pinch out the tips of the remaining stems to encourage a tall, bushy growth habit. Clip flower stems after the flowers fade. This keeps the plants looking tidy, and also prevents the flowers from dropping seeds. If after a few years your phlox plants fail to bloom as magnificently as they once did, this may be a sign that they need to be divided. 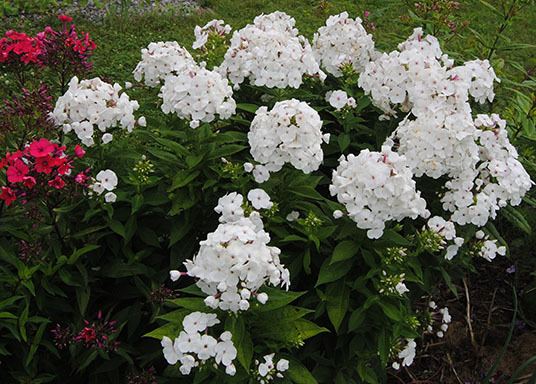 As a general rule, phlox plant division can be done every two to four years in spring or fall. Splitting phlox plants can be done in spring or fall, but should never be done on hot, sunny days. When diving phlox in spring, it should be done just as the new shoots appear. If splitting phlox plants in fall, be sure to do so at least four to six weeks before the first expected frost date for your location, and you need to mulch divided plants well before winter sets in. About 24 hours before phlox plant division, water the plants deeply and thoroughly. You should also prepare the site for the divisions to be planted, loosen up the soil and add any required amendments. Phlox plant divisions should be planted immediately, but they can be planted in pots with potting mix temporarily to give to friends and neighbors. To divide phlox, cut around the root ball with a sharp spade, then gently lift the plant out from the ground. Remove excess dirt from the roots. Separate the roots into sections with three or more shoots and adequate roots with a sharp, clean knife. Plant these new divisions immediately and water them thoroughly. Watering with a rooting fertilizer can help reduce stress for the plants and encourage quick rooting.